This marks the first matchup since a great 2013 sub-state championship game that Osborne won 42-34 en route to a state title. The Bulldogs set an eight-man record for single-season scoring offense with 760 points that still stands today. Osborne had defeated Clifton-Clyde, 80-32, in the regular season. Both teams have enjoyed a rise this year. Cifton-Clyde had back-to-back young squads and won a combined three games in 2014-15. Osborne went 4-5 last season, returned basically the entire roster, and is 9-0 this season. Both teams have a huge Week 4 victory. Osborne defeated Pike Valley, 34-32, on a stopped two-point conversion late, while Clifton-Clyde defeated Rural Vista, 74-72, in double overtime the same night. Osborne had key wins versus Solomon, Logan-Palco and Victoria in district play, while Clifton-Clyde also defeated Herington to essentially secure a playoff berth. Osborne has the No. 1 offense in the classification with 522 points and continues to be very similar with the 2013 team. In 2012, the Bulldogs finished 6-3 and missed the playoffs. The next season, Osborne had a strong defensive improvement and averaged 59 points a contest. This year, the Bulldogs have enjoyed big strides defensively and averaged 58 points a game. Osborne has its backfield depth led by senior quarterback Justin Burch, senior running back Cullen Grabast and junior running back Denton Schurr. Osborne has scored at least 46 points in every contest, save the Pike Valley game. Its 54-8 Week 7 win against Victoria marked the most points the Knights had permitted since Week 6 of the 2014 season. Osborne averages 332 rushing yards a contest. Both Grabast and Schurr have 21 rushing scores. Schurr is 1,139 rushing yards, Grabast stands at 1,020. Cifton-Clyde has senior back Caleb Charbonneau in the single-wing offense and averaged 51 points per contest. Six starters return on both sides of the ball and sophomore back Drake Steinbrock has played well. However, the Eagles have permitted 28 points a game and lost by the 45-point margin to No. 3 ranked Burlingame. This game is high-scoring, but Osborne is too high powered to shut down. Both squads are inexperienced and have posted somewhat surprising seasons. Central Plains returned four offensive and three defensive starters. Argonia-Attica is the two-time Eight-Man, Division II state runner-up, but graduated virtually all of its top players, including quarterback/linebacker Alec McDaniel and running back Devon Newberry. Junior Trevor Pierce and senior Seth Hemberger has emerged as standouts for A&A, which earned a quality win versus South Barber in the non-district. Last week, the Titans lost to South Central in a game that decided both playoff berths out of District 6. Argonia-Attica has averaged 119 passing and 194 rushing yards a contest. Junior Trevor Pierce has completed 74 of 1,032 passes for 1,075 yards with a 22/8 TD/INT ratio. He also has 86 carries for 589 yards and 10 scores. Hemberger has 125 carries for 887 yards and 19 rushing scores. The Titans have averaged seven yards a play with 15 offensive turnovers and are minus-6 in turnover margin. Hemberger paces the squad with 104 stops. Central Plains is now 9-2, 13-0, 9-2 and 9-0 in the last four seasons. The Oilers had a great first month with Central Prairie League wins at Victoria, versus Ness City and at Otis-Bison and then cruised through district play. All three CPL teams finished with winning records. Junior Alex Barton is one of eight-man’s top all-around players and sophomore quarterback Devin Ryan has capably stepped in for graduated Braedan Crites. 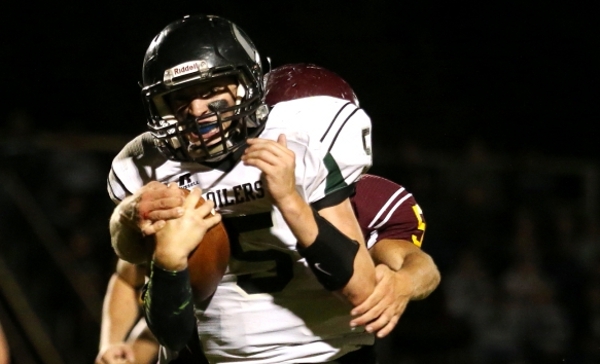 Central Plains uses a backfield by committee led by Alex Hickel (489 yards, 9.4 yards per carry, eight scores). The Oilers have averaged 165 rushing yards a game and 157 passing. Ryan is 73 of 106 passing for 1,312 yards with 28 touchdowns against two interceptions. Barton has 36 catches for 711 yards and 16 scores. The offense averages 8.2 yards per play and has just four turnovers. Central Plains is plus-20 in turnover margin. The Oilers have eight non-offensive touchdowns, including three pick-sixes from Barton. He also has a punt return for a score. Both coaching staffs deserve a lot of credit for producing strong seasons with inexperienced squads. Barton is the best player on both teams, and Ryan has played like a veteran throughout the year. Even when the Oilers have had injury problems, another player has stepped up. Central Plains, boosted by its depth, great turnover margin, and home field advantage, gets the win.